The Dr makes his West Coast Debut! 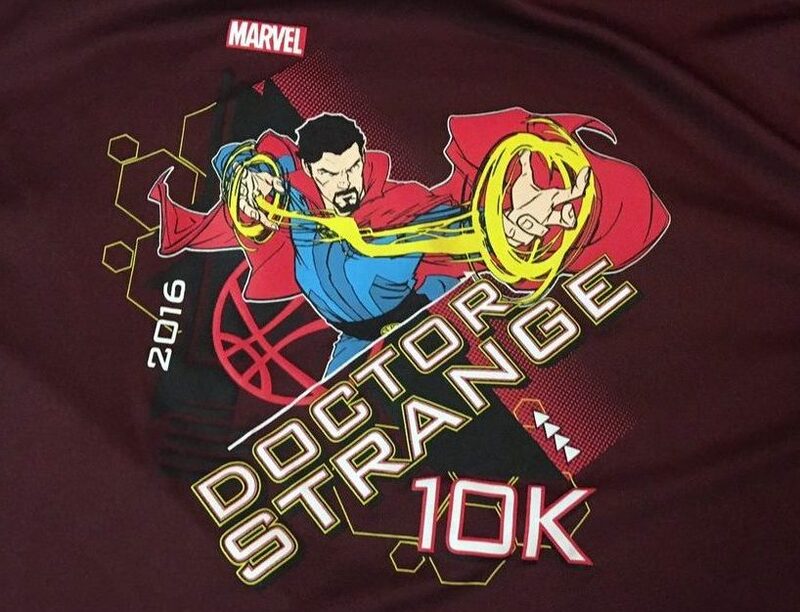 The big deal today was the debut of Dr Strange out on the West Coast. We caught him on his East Coast debut the week before, but only children were allowed to get a picture with him. Today I was getting my shot to get a picture with him. 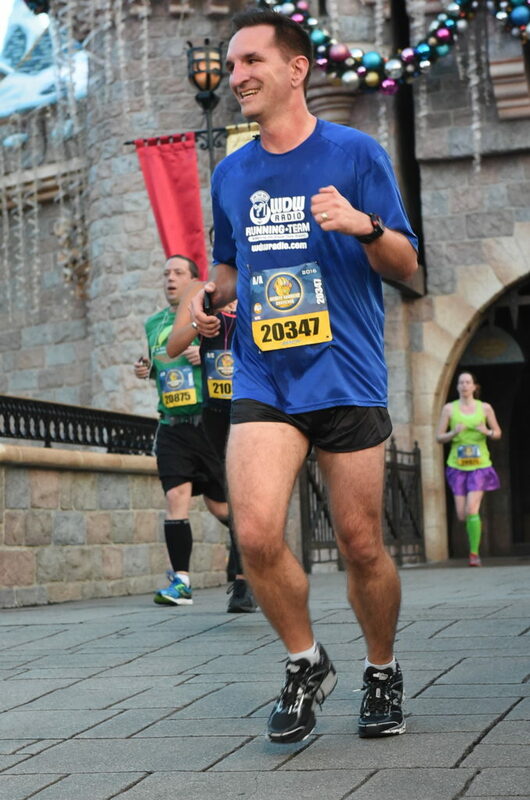 This course again was similar to the Disneyland 10k. It seemed like it was a tad bit less park than before, but maybe it was just less backstage running. I caught half the course in the dark and half as the sun was coming up. 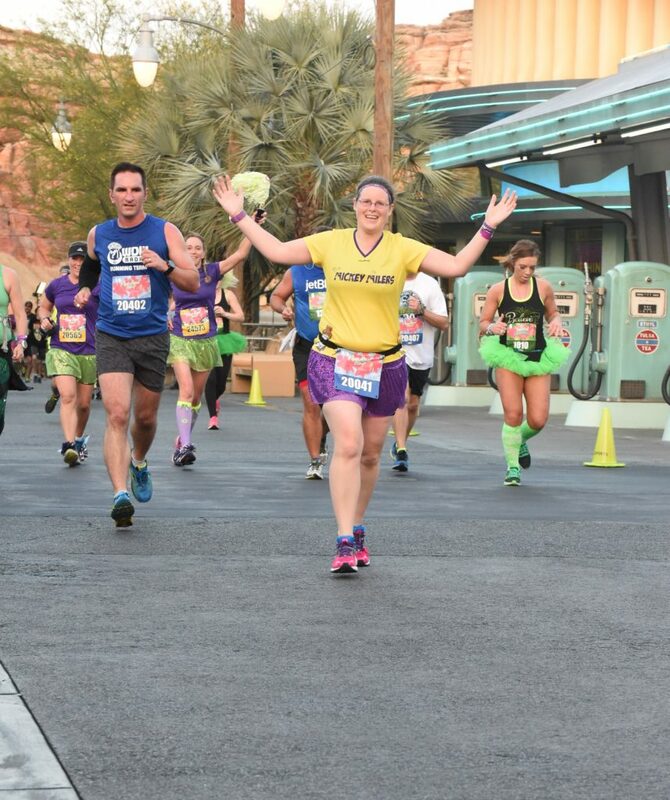 It really is a blast to run through the parks. 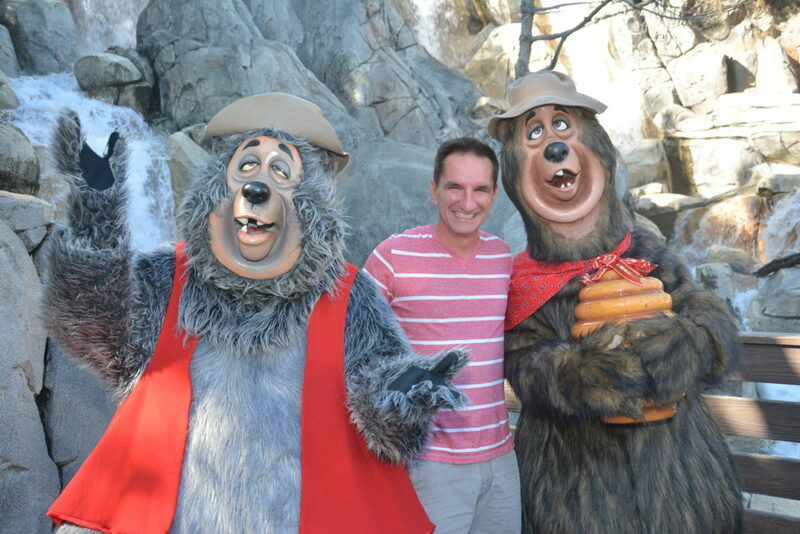 There is always a good group of cheering in the area between the parks as well. Since I got all the characters yesterday it was time to do some fun pictures with them….in the 10k short shorts of course. 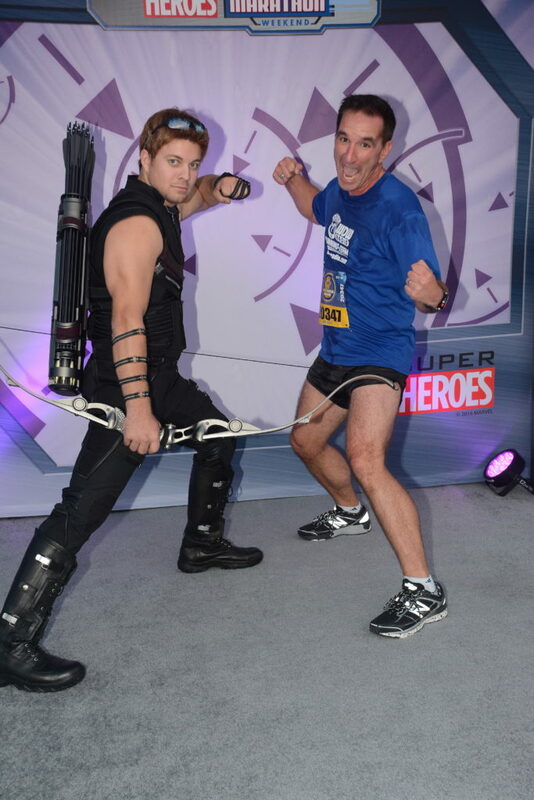 I don’t think Black Widow was impressed and who needs Thor when you when you have these guns? 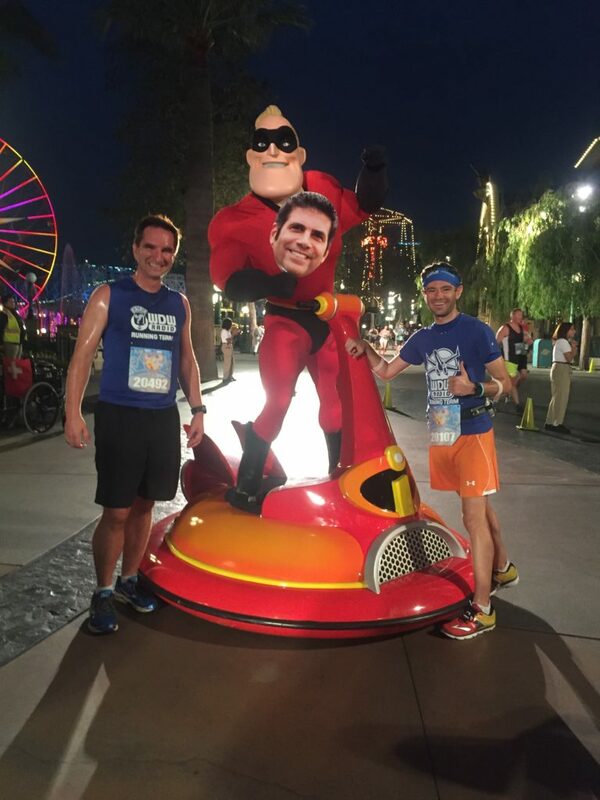 All in all it was a pretty straight forward Disneyland race. 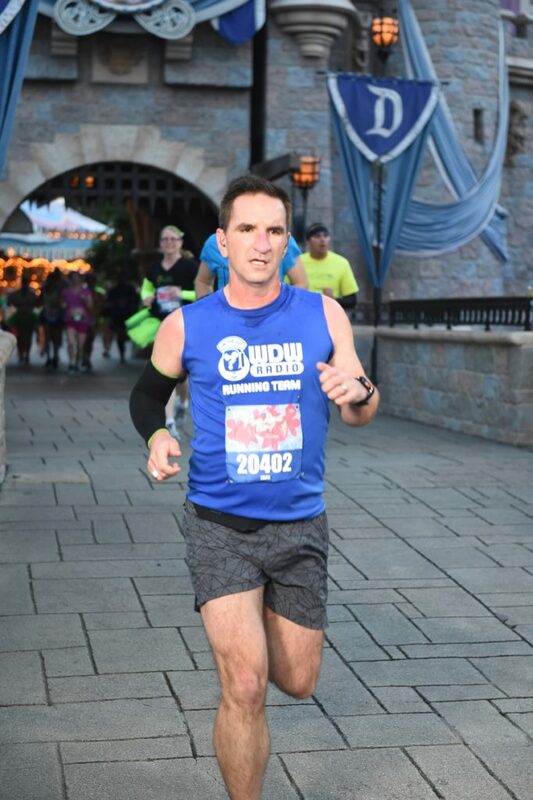 Even with it being more a “regular” race, you still can’t beat running through your favorite lands and the castle. 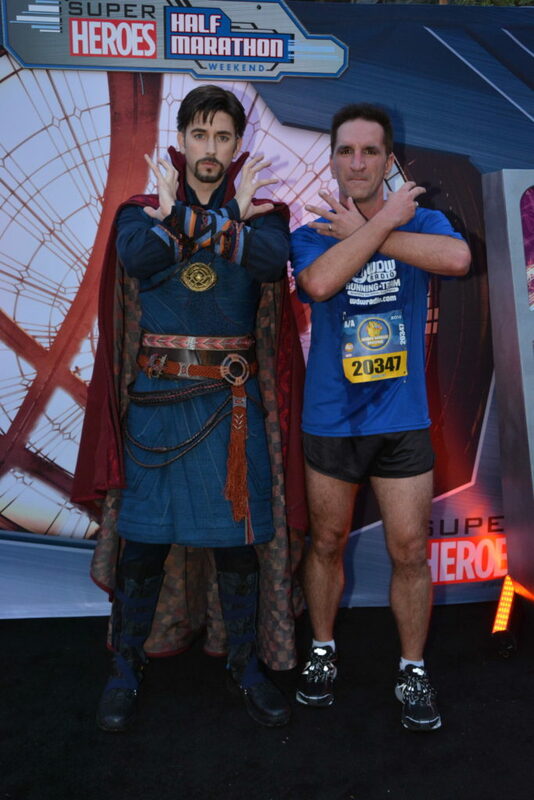 Towards the end, was Dr Strange himself! It took me 5.5 miles to find him, but I was able to check him off the list. He wanted to do a spell pose, so why not? Nailed it…..maybe not. Love all the detail in his outfit. After that, it was off to the the finish! I hit the parks pretty hard this trip to ma ke sure I soaked in all the Christmas decorations. 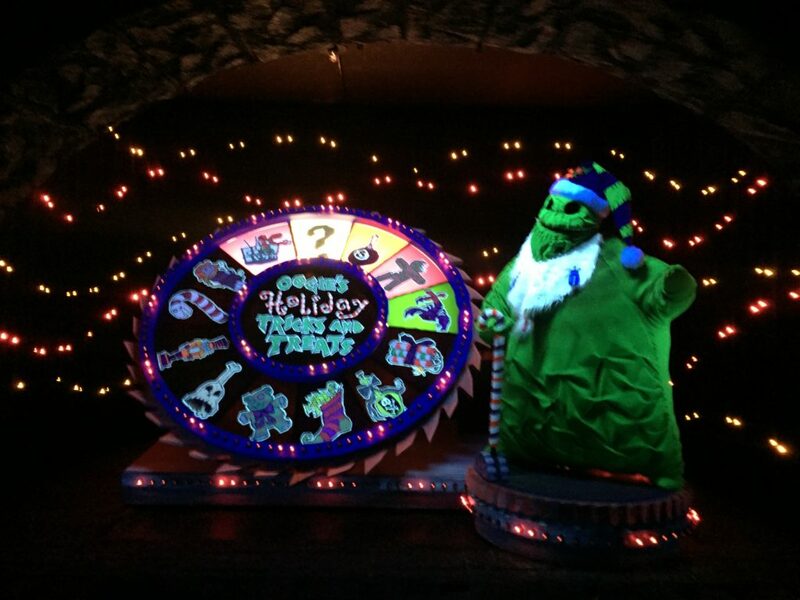 I absolutely love the the Haunted Mansion overlay at Christmas. They do the whole thing from the inside out. I think I jumped on it four times during my trip there. I may even like it more than the regular ride. 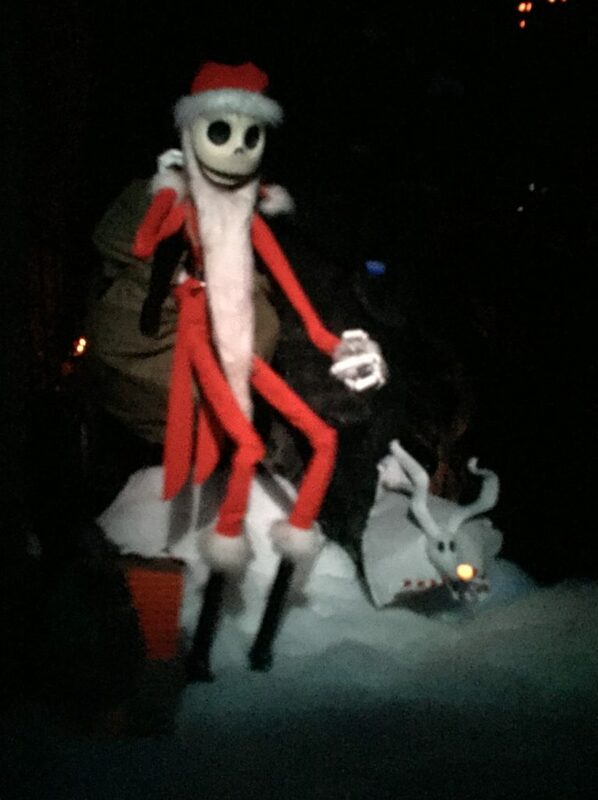 They will also have Jack and Sally greet guests outside the attraction during different parts of the day. It’s usually up around Mid Sept through Christmas, so if you have a chance, check it out! 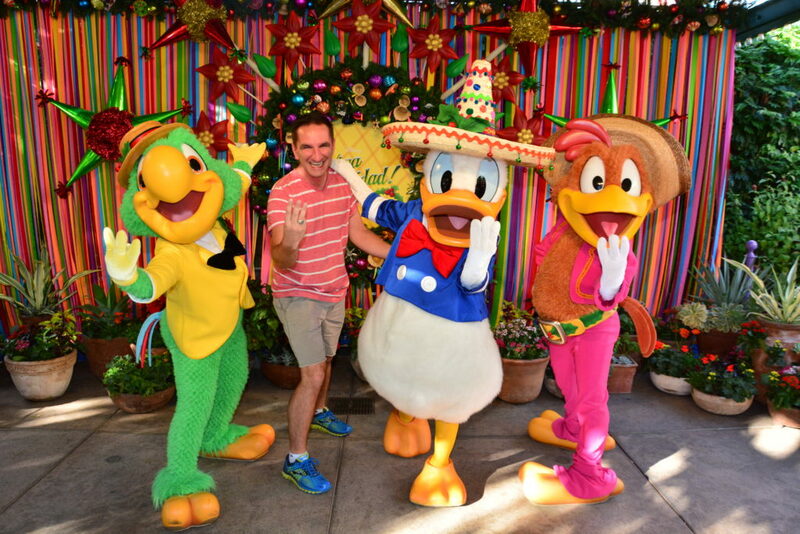 I also had a great chance to meet the Three Caballaros! They were hilarious when I told them how long it took me to finally find them. 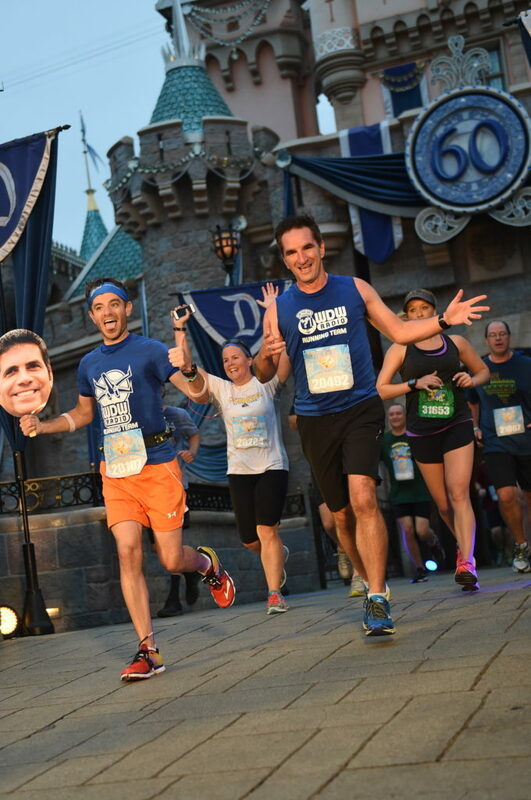 Luke and I got the regular set at the Disneyland Half, but they were raised up on a platform. 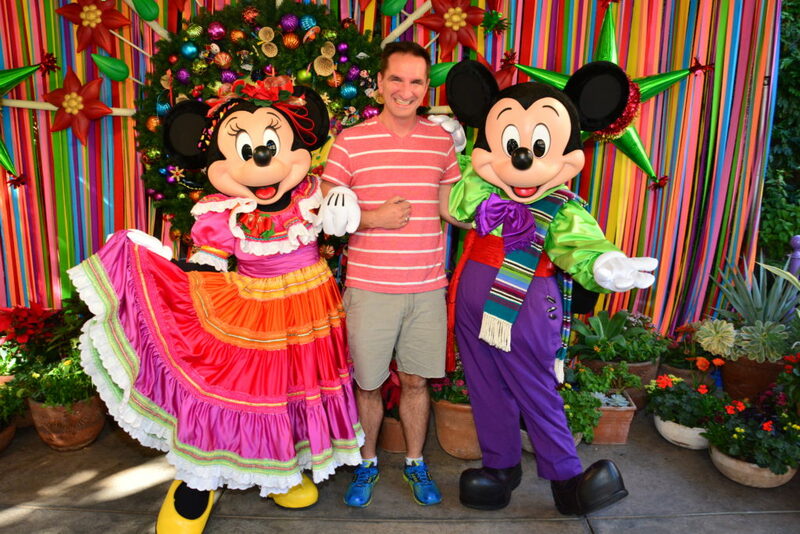 I also loved the fiesta themed Mickey and Minnie! 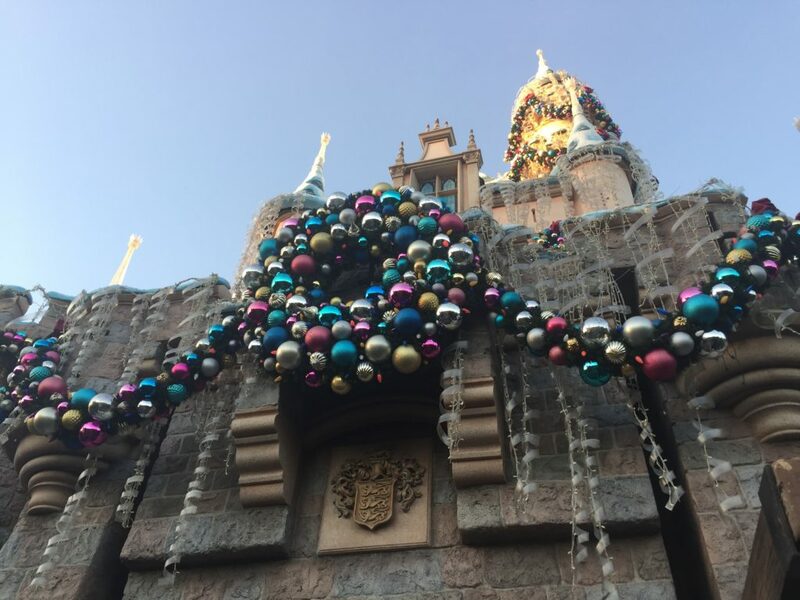 Disneyland does a great job of updating their characters for Christmas. Almost every single one has at least a little Christmas twist to their normal outfit. 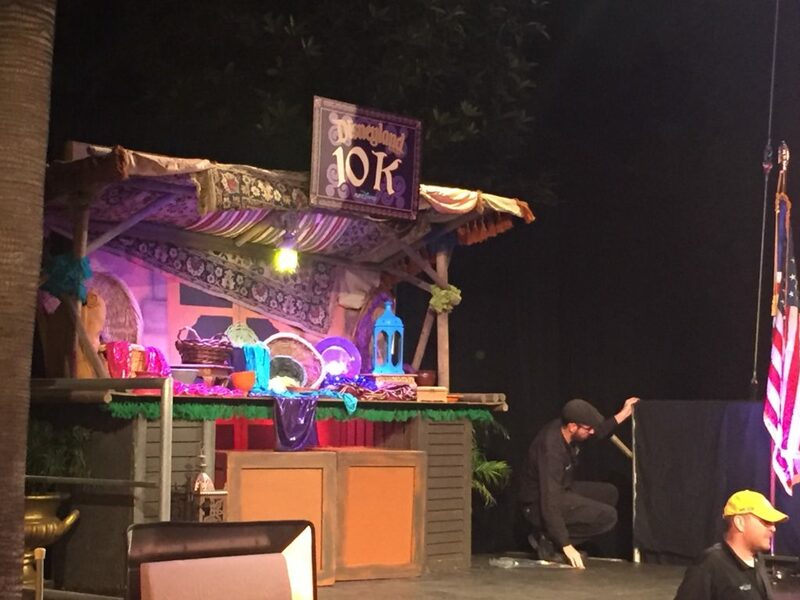 They even had props at several locations this year as well. 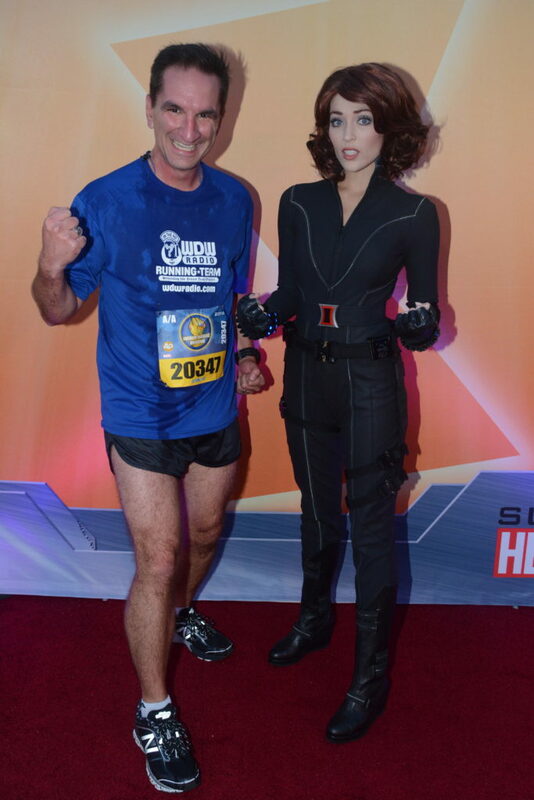 UP NEXT: AVENGERS HALF MARATHON! Here we are back for day two! We hooked up with Thaddeus beforehand and got a team picture before heading out to the corral. It’s always great connecting with folks you haven’t seen in a while. I get asked from time to time if there are any differences between the east and west coast races. There are a ton that I’ll cover in a future update, but here is one of them. 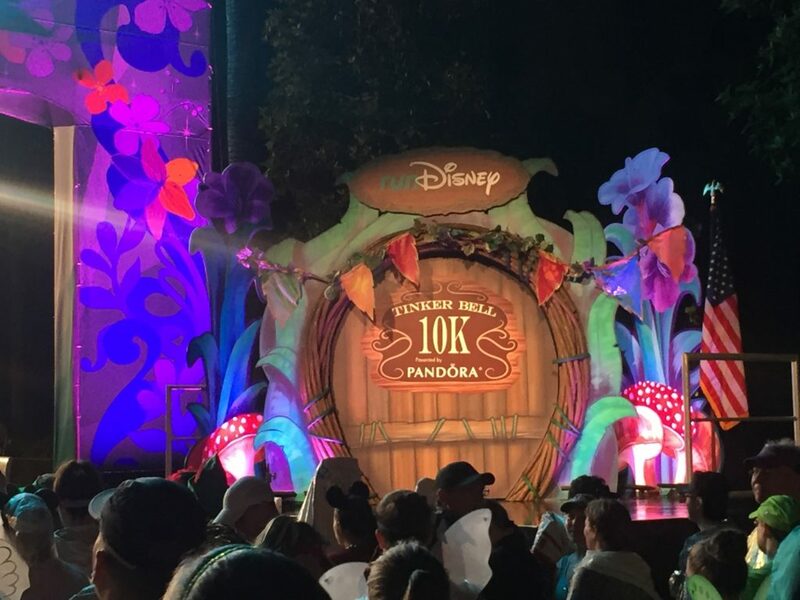 Disneyland builds little sets for each race while Disney World races use the same platform over the weekend. I love some of the neat touches they put into the races out here. Luke and I had a great time the day before. We greeted cast members and had fun interacting with the crowds. 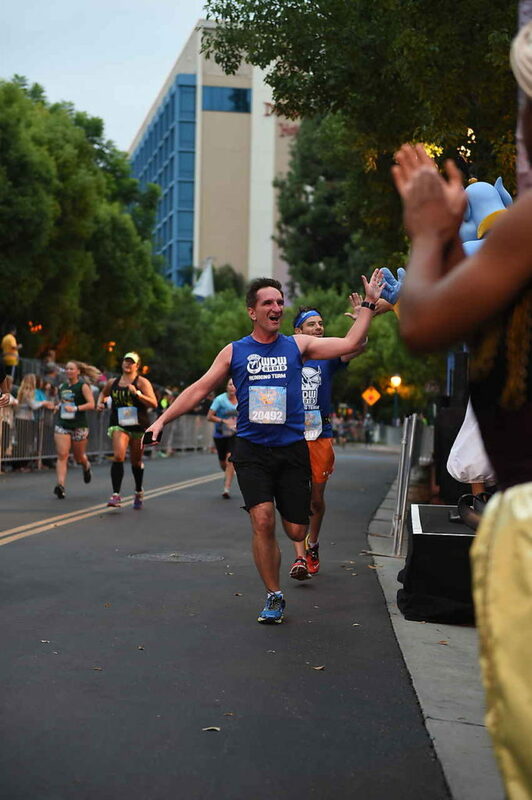 Something special happened during the 10k. We just clicked. 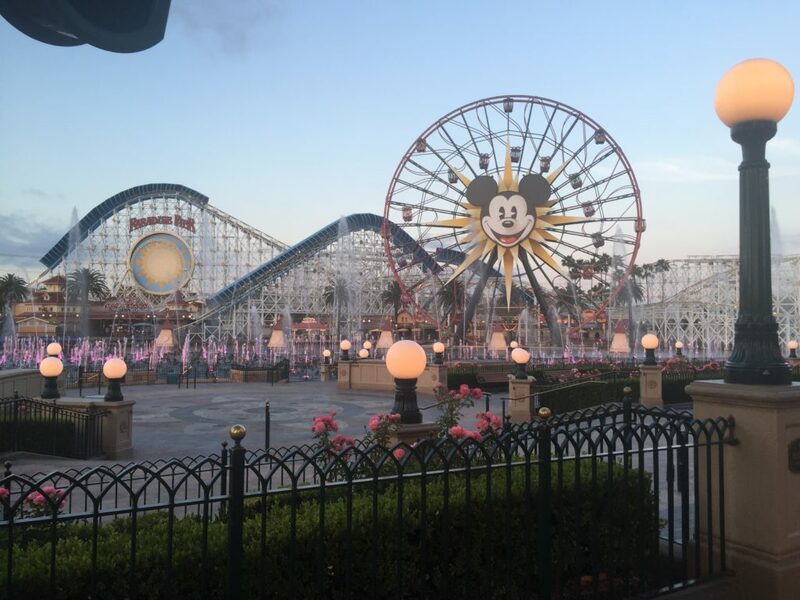 We became peanut butter and jelly…….ice cream and churros……Space Mountain and a fast pass. Without discussion we interacted with and hyped up the whole course. What we were not prepared for was how many people would recognize us over the weekend. It was crazy! It’s getting harder and harder to find new characters on the courses. 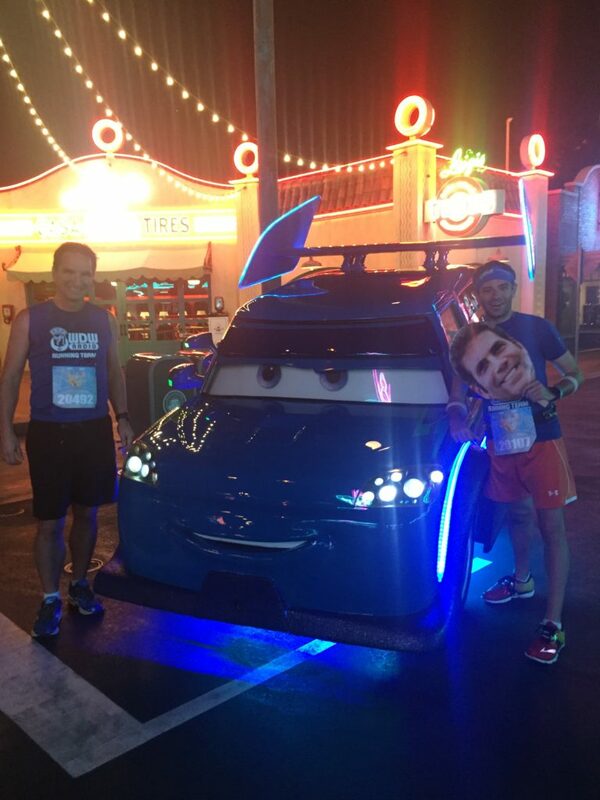 I didn’t pick up any on the 5K, but we did get the DJ car from Cars on the 10K. You can see it at impromptu dance parties in the park, but you can’t get a picture with it. 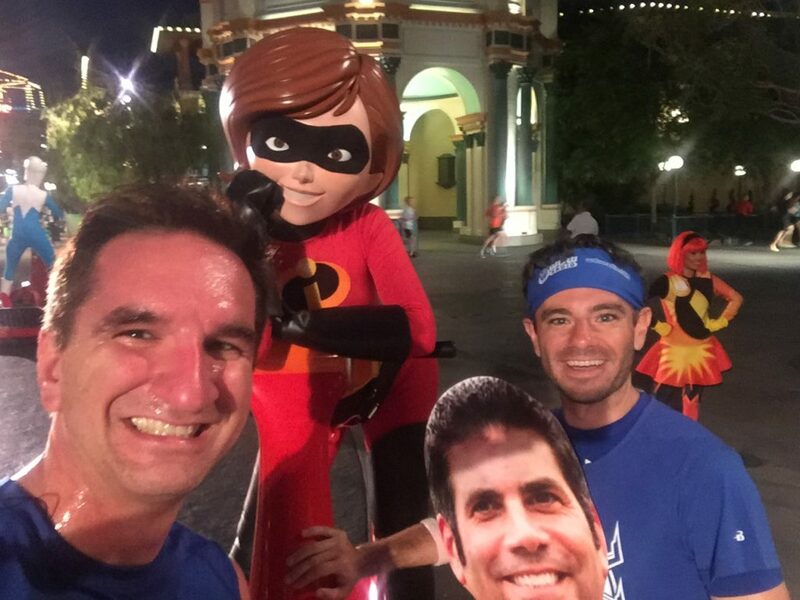 We turned the corner out of Carsland and the full Incredibles set of characters were out there. We had a great time with them and they were super fun. 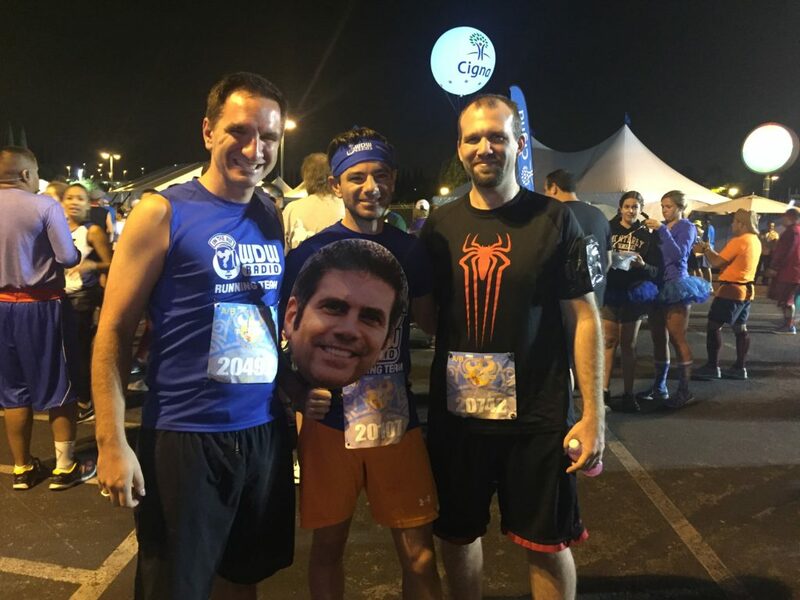 They loved the Lou head we had with us! We didnt know it at the time, but this would be the last day Jasmine would wear this outfit. 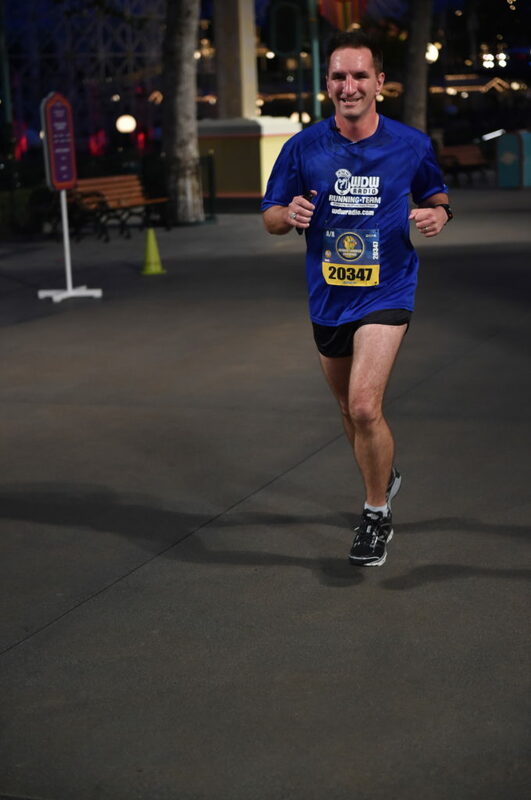 So getting those awesome clear shots from the photopass people are more challenging at the 10K and half. 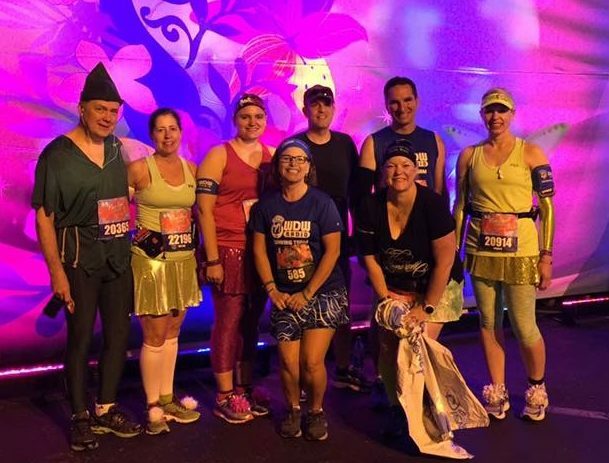 The strategy instead of trying to destroy everyone is to find bubbles…..areas between groups of runners. They are easy enough to find if you are looking and then you can get some pretty good shots. You’ll probably either have to speed up or slow down, but it is worth it. You get the shot below instead of being the guy in the Texas shirt in the back. We turned the corner onto Main St and ran into Eeyore. He was great for a couple of reasons. First a lady came up that was a Eeyore fanatic…. like screaming “Don’t go! Don’t go!” The second great thing was all the Eeyore impressions that Luke and I did about racing after we left. We then got a shot with the firetruck in front of Walt’s apartment. That was pretty fun! 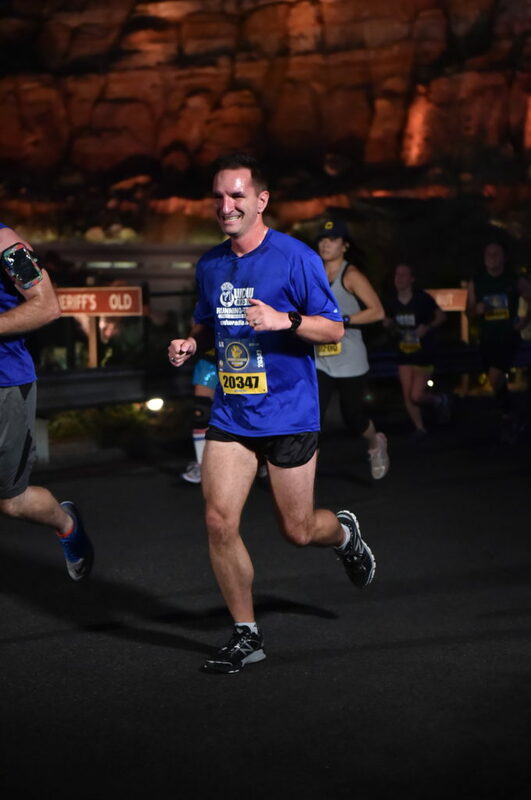 Now the final stretch was where the dynamic duo really got to shine. We both took a side of the street and yelled to the crowd, greeted them and got them going. I’m pretty sure there was a point where Luke was yelling at them and I was doing a weird version of the robot and break-dancing at the same time. People loved us….. except for the people at Starbucks. Don’t greet people in line for coffee, they are not fully functional yet. We got major shout outs from the announcers at the end and we made sure we finished in style. Of course, we had to stop by and see our favorite photographer! 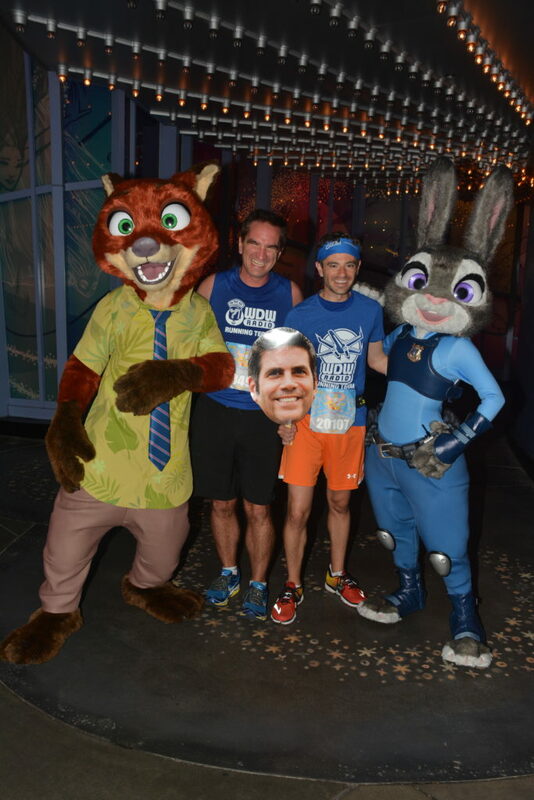 I thought there were characters here…. It’s crazy how much of a community this race series is. I’m on the other side of the country and I’m riding on attractions and doing character meets with friends Derek and Jennifer. I run into Beatrice in the rain as I was heading to see a movie. 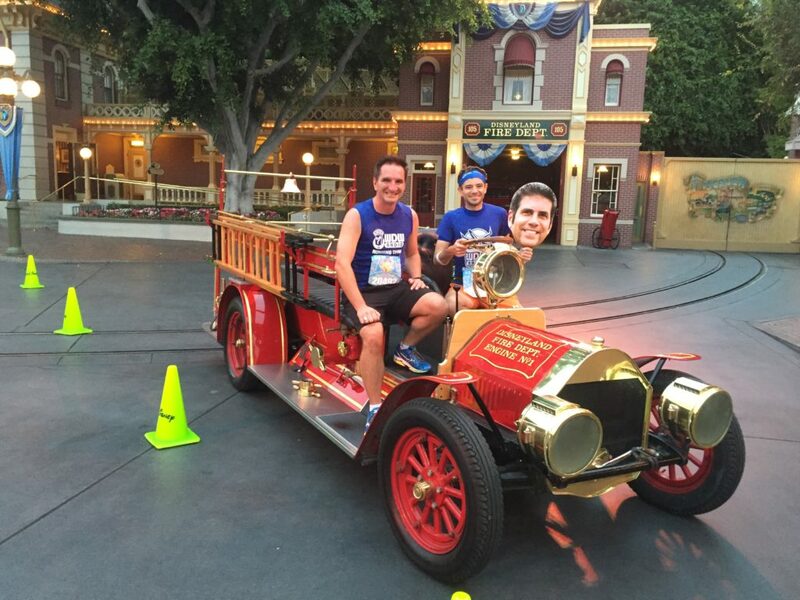 Dave and I are getting photos in the Autopia booth at the expo….and of course there is the WDW Radio Running Team. Big groups or small, we always look out for each other. 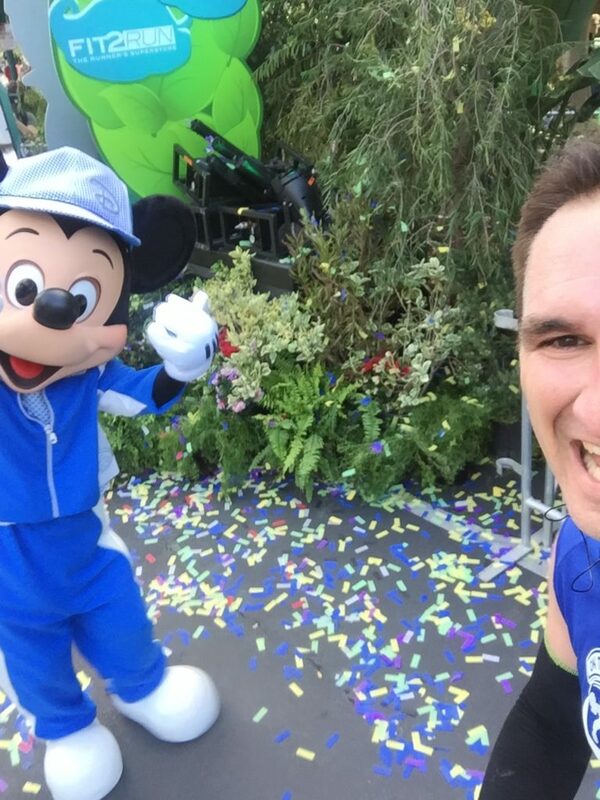 The one thing that Disney has no control over is one of it’s biggest draws: The people and friends you make on the course. 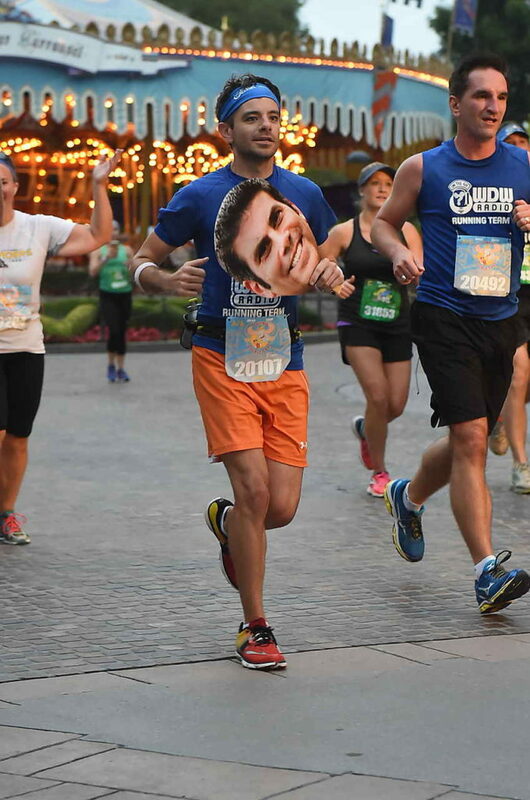 My mind was psyching me out for a week before this race. 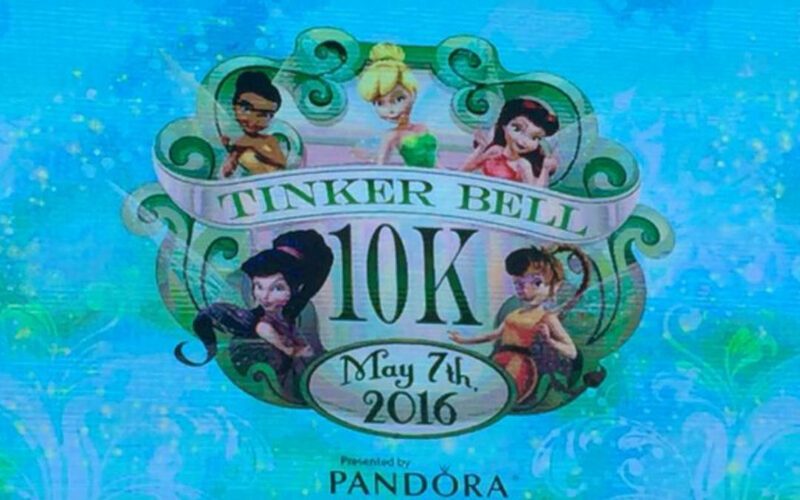 Some friends had told me that this was one of the two best times to go for 10K PR or placement at a Run Disney event. I mean it didn’t matter that I had only run a total of nine miles in 3 weeks. This was going to happen. By the time I stepped on the plane, I had talked myself out of going for speed at any race. 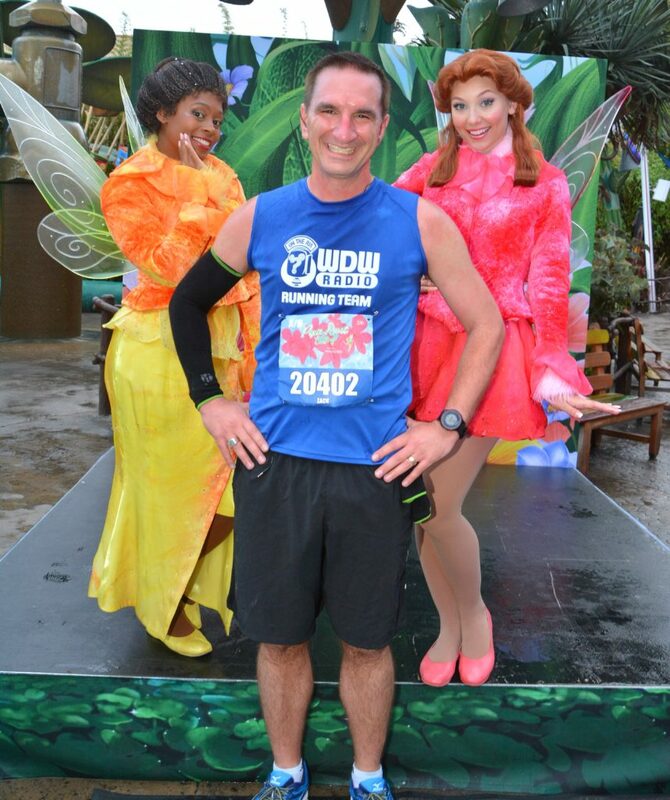 Then the Tinkerbell 5K happened. 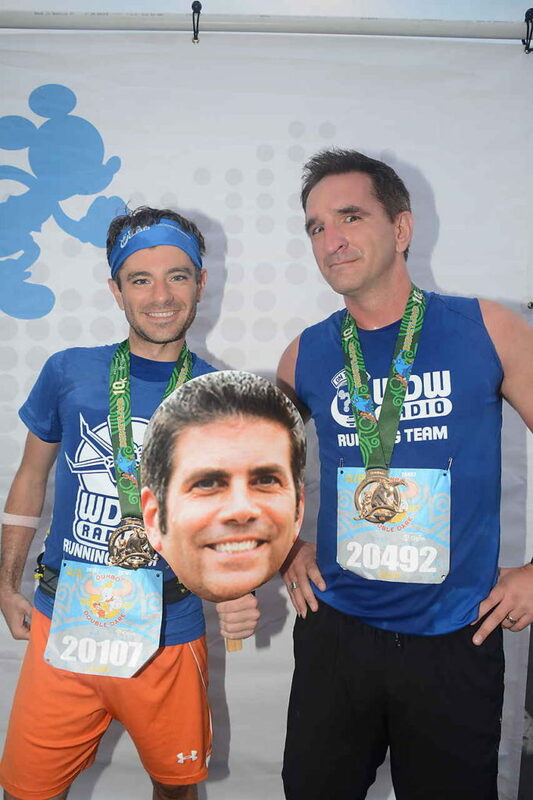 Immediately after the race my brain brought back the thought of a quicker 10k. I fought it and believed that I had won until the start of the race. They did have probably the coolest announcer stage so far here. People would come in and out of the doorway. It was raining off and on that morning before the race started. It was also about 52 degrees. I had bought some arm warmers to wear because I was not prepared for the cooler starts, and boy I’m glad I did! It turned out the rain stopped about 15 minutes before race time. My brain then switched in to “game on” mode and it was time to get going. I was super stoked to see Vidia. These fairies are so hard to get now on the east coast and I’ve always missed her. (Yes I know I’m a nerd) She thought it was hilarious that I was so chipper and excited to see her. This is one of my favorite pictures, because she’s laughing and pointing as she says, “I love this guy!” I love you too Vidia. Another fun moment was that I was the first one to get a picture at the partners statue. 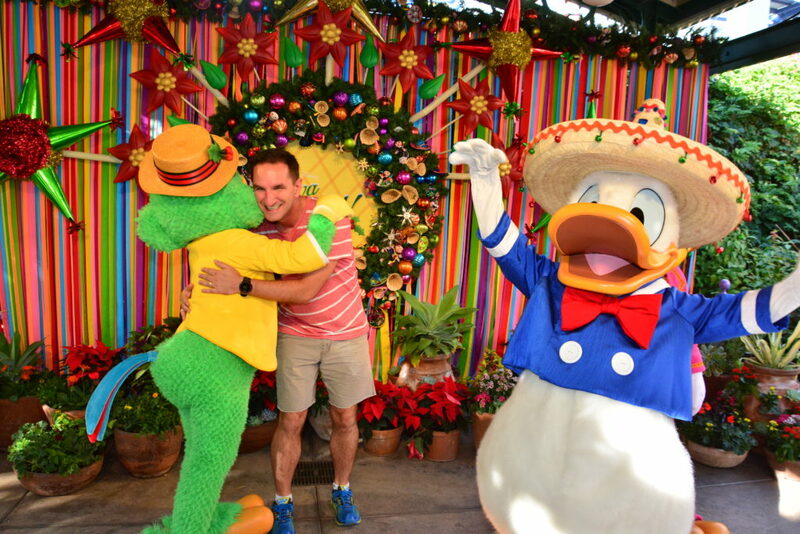 The photopass people were awesome. In general I have enjoyed them more than the outside group that used to take pictures at races. 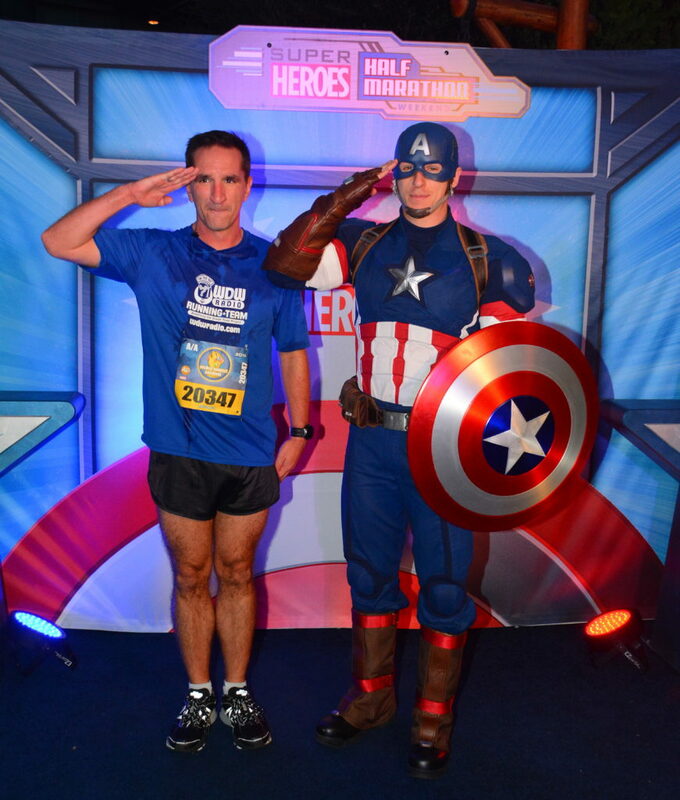 I really didn’t get too many pictures at this race. I did stop for one other Fairy stop. 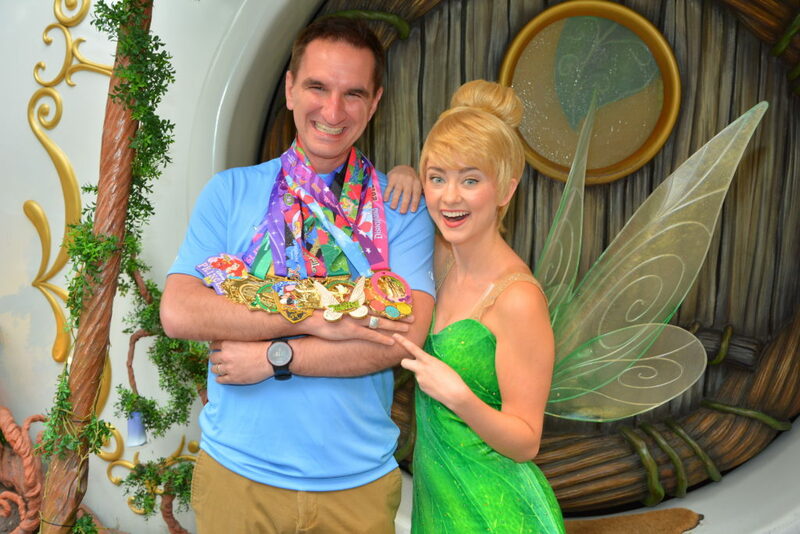 There was also Tinkerbell and Peter Pan out as well. 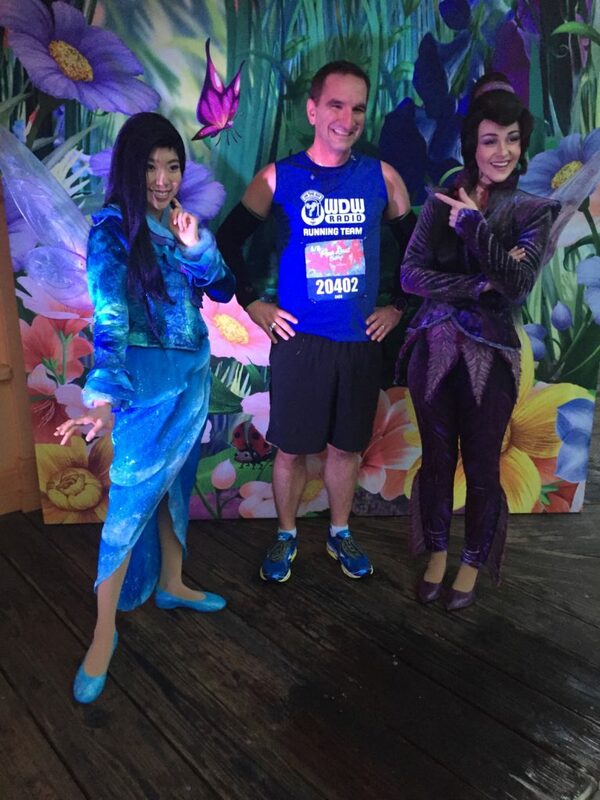 Not much different from the 5k as far as characters. 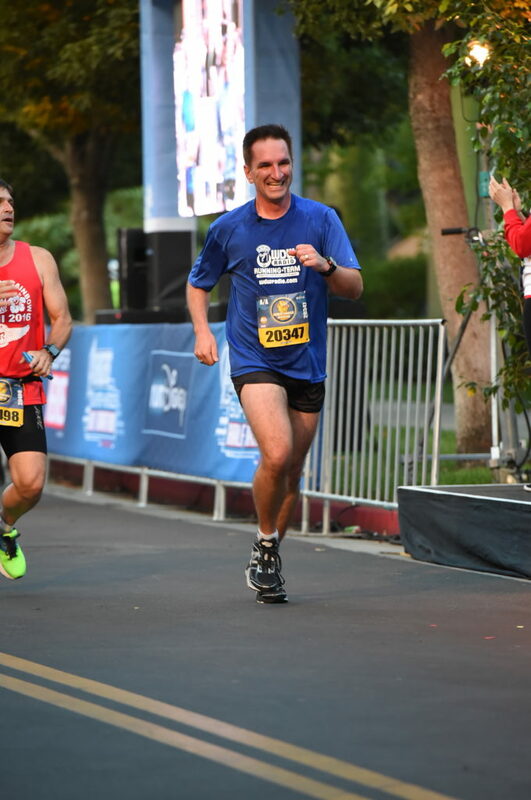 I ended up finishing top 2% in the 10K which was really exciting. 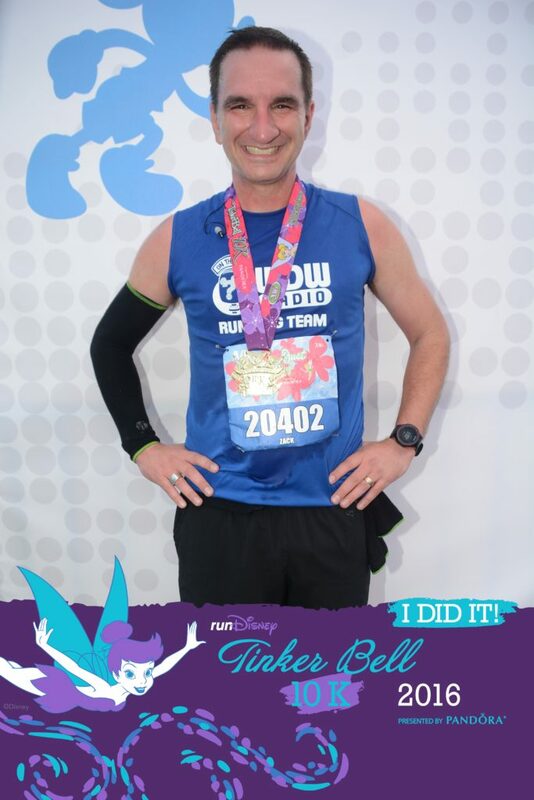 I even got some shout outs (the picture above) for the running team as I crossed the finish line. 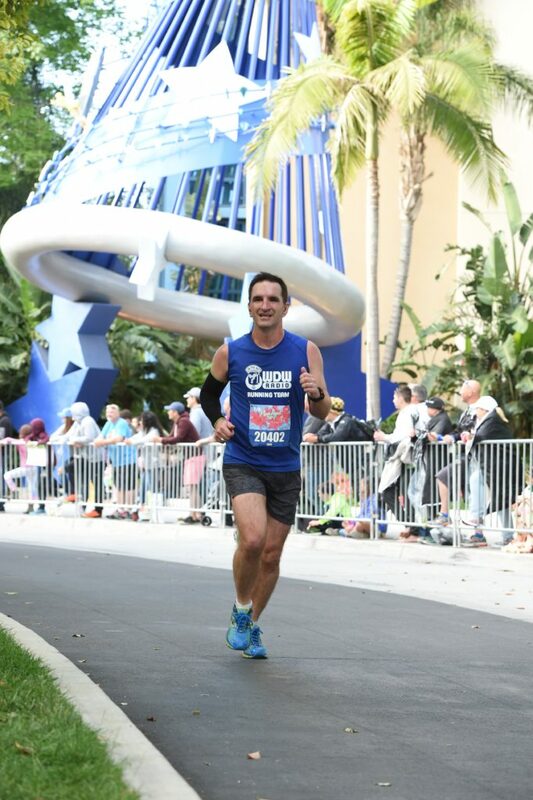 I would have easily blown my PR out of the water had I not stopped for pictures on the course. I didn’t take the “shortcut” back to the hotel this time and made it back pretty quickly. 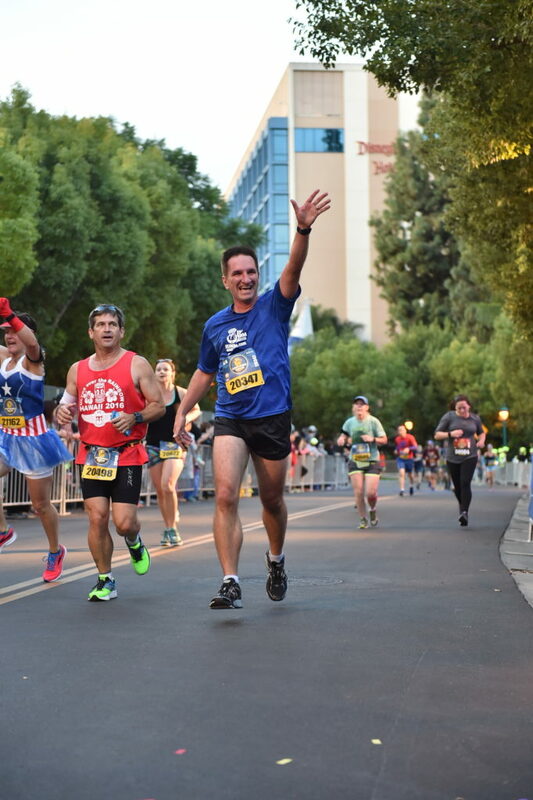 Up next: The half marathon! 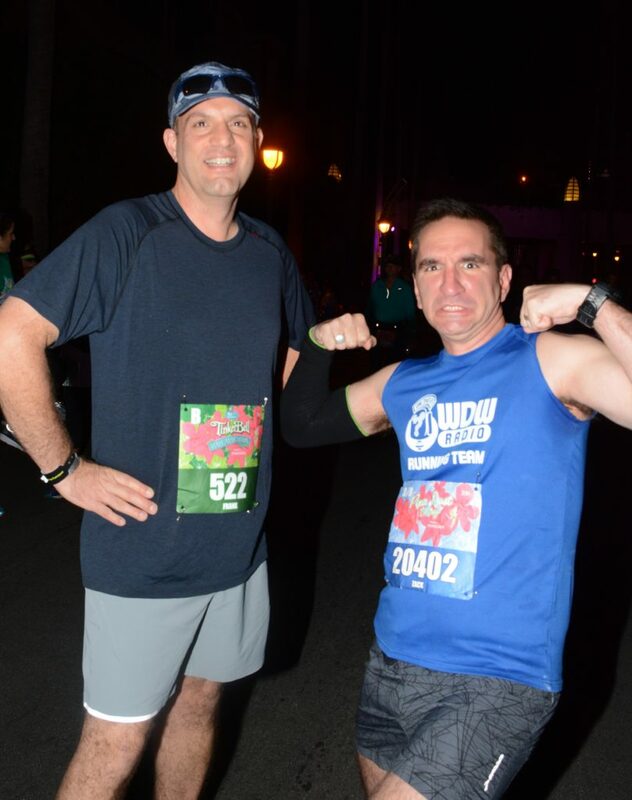 Frank and I were in the first “dudes allowed” corral for the race. 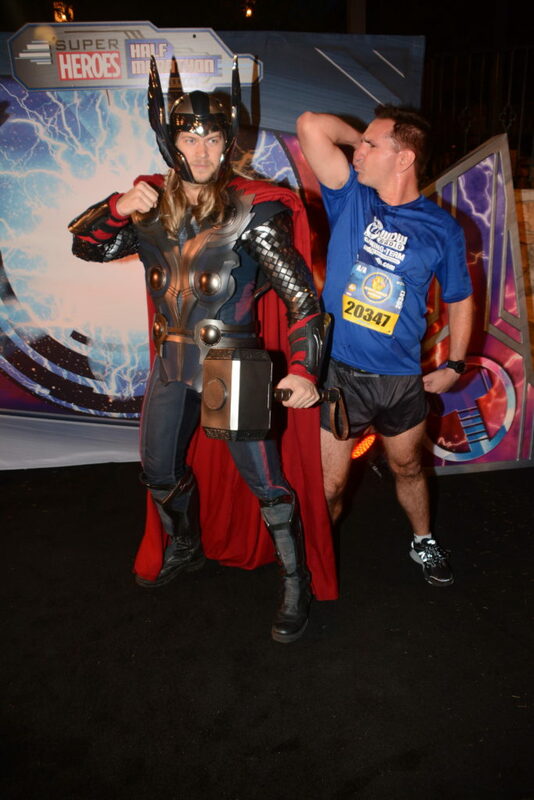 He was telling me his goal for the race which was a pretty good pace. I told him about cruising today and it was just as much about telling myself that so I wouldn’t kill myself for day three. 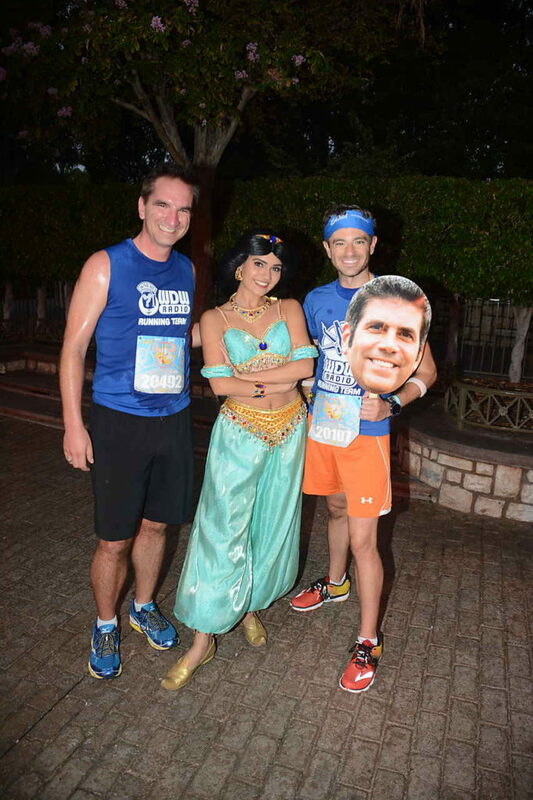 There was an awesome photopass guy that worked the front and back of the race. He was giving high fives out like candy all three days. 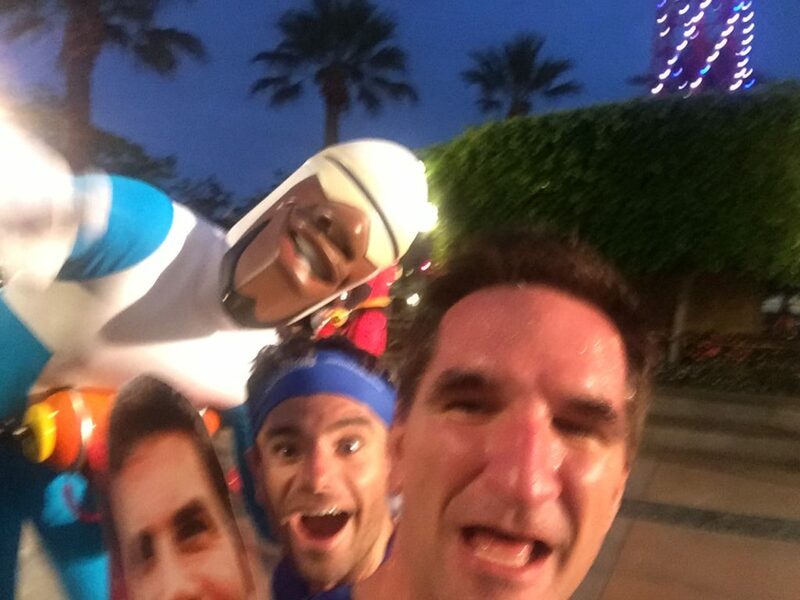 He danced with the runners at the pre-race party and was super excited to see each individual runner after they finished. We saw him dancing again this morning before the race, and wouldn’t you know it that Frank and I ran into him in our corral. He was making everyone do specific poses for him at this point. We get up there and Frank leaves me hanging on the tough guy pose! He also forgot his team shirt so I’ll just shame him right here. There were a ton of people in our corral! We were also further back than I typically like to be. I don’t do a sea of people running very well. I then made a decision to just get out in front of this corral and then take it easy. The corral goes off, and I swear I’m swimming in people! I stick to Frank and let him part the ways for the first 1/2 mile. It took a mile and a half to get fully through the corral. I was feeling pretty good at this point and then made a second change to the original plan: just keep the pace until you want to slow down. It was still fairly crowded going through the parks. 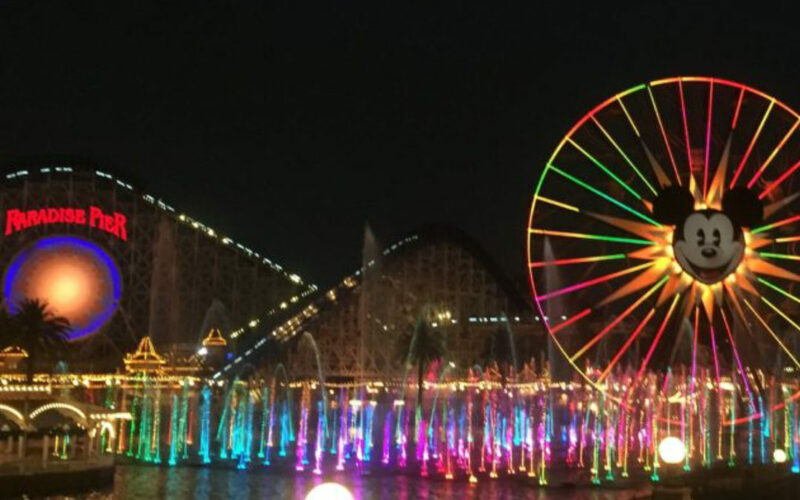 It’s hard to know because the numbers are on the front, but I think I hit corral A around California adventure. It was here that I got one of my favorite pictures of the day. 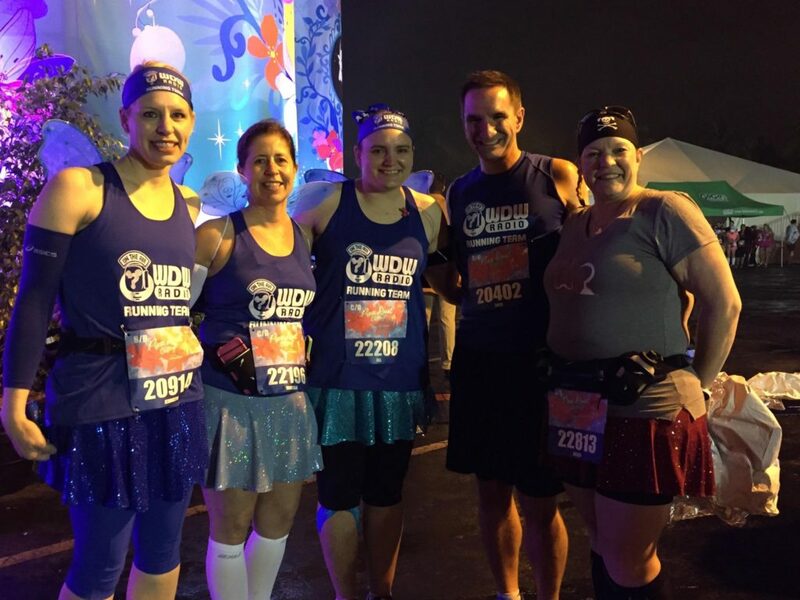 WDW Radio and Mickey Milers are probably the two biggest groups that are out on the course. You can identify us by our Lou Blue and them by their bright yellow with a touch of purple. We aren’t rivals by any means, but I had to make sure I got in this shot. You never know who is behind you! 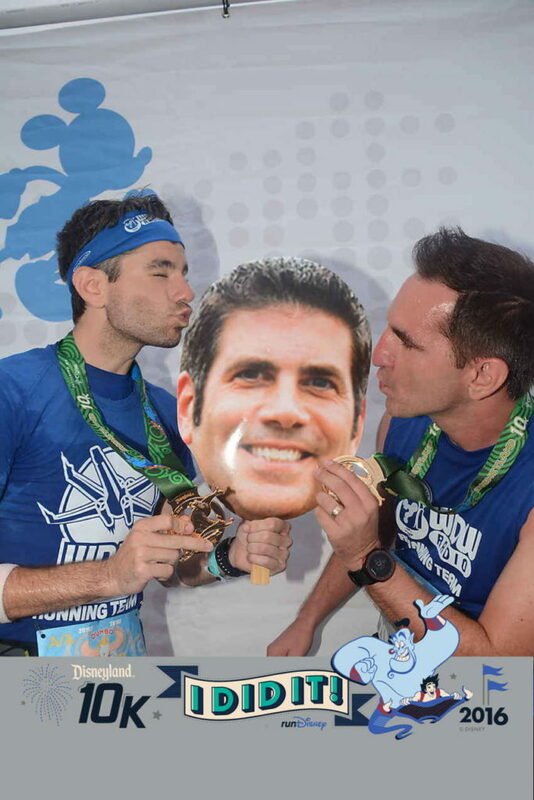 The stories about the DL races are true. 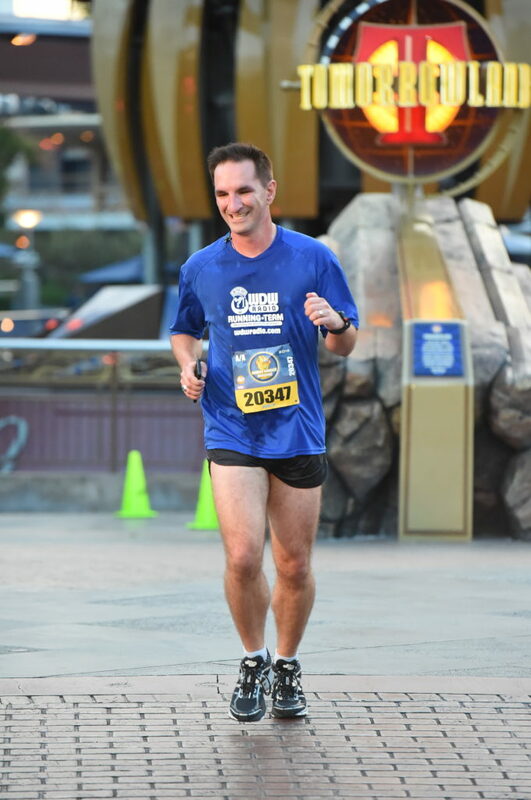 You do about half the race in the parks and half out in the city of Anaheim. Sometimes they throw you in to a cool place like the nearby baseball stadium. This time? 7/11. 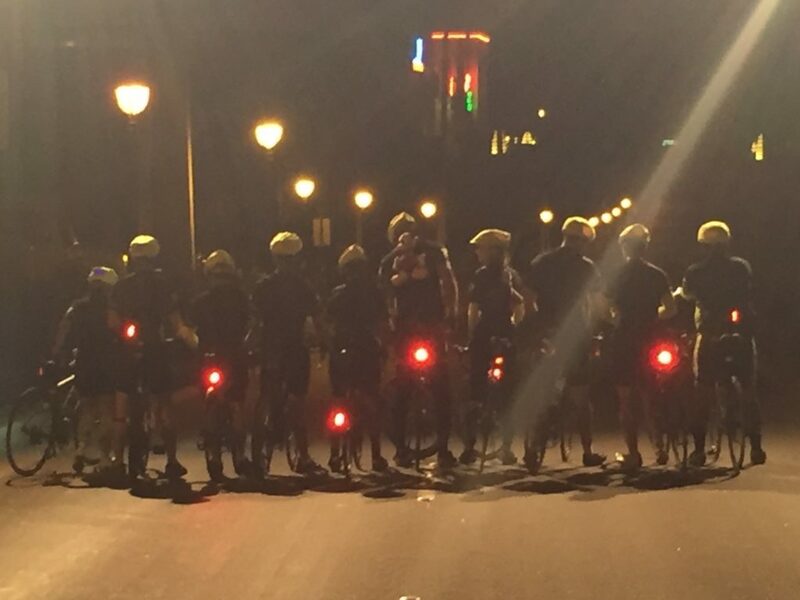 The back half of the race really is like any other road race. You have the occasional school band out playing but that’s about it. 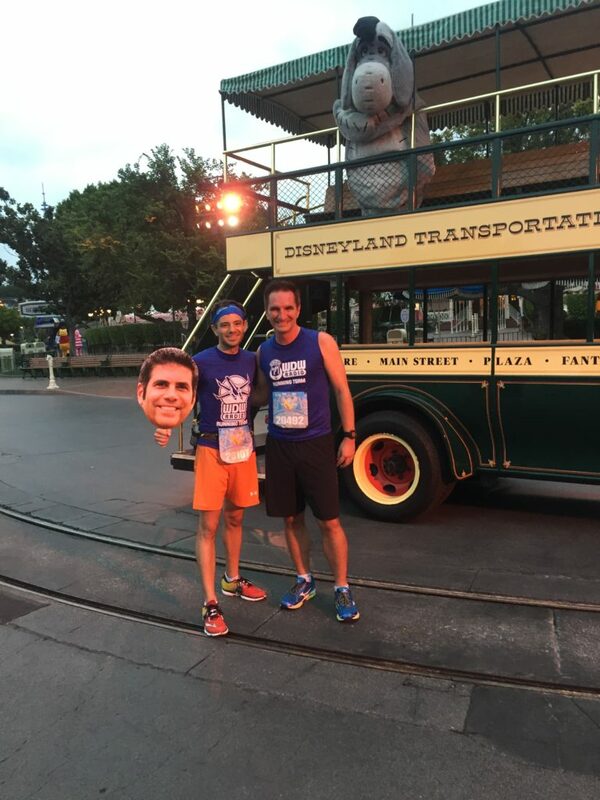 No characters or Disney touches besides the mile markers. 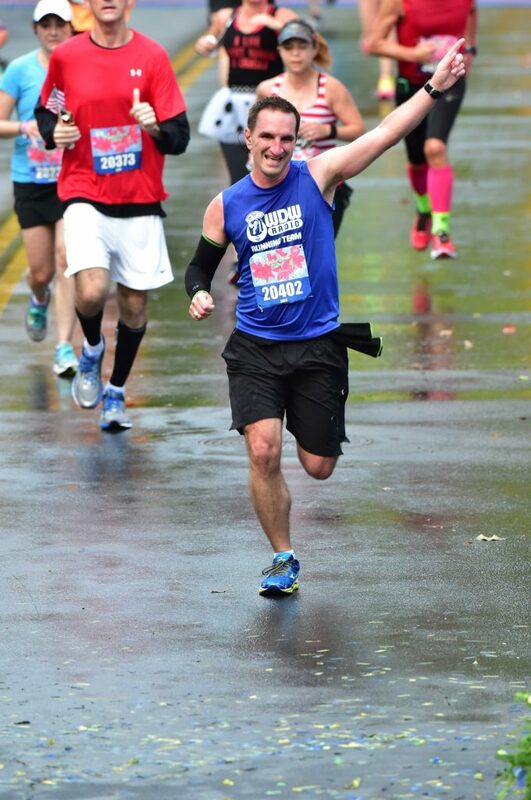 The fatigue was starting to set in at mile 7, but then there was the final change of plan. The brain was fully in control now and just told me to keep pushing. 7-11.5 was a beast. There were some cool people out cheering on the course though. You enter back in to the park for the final stretch where the course parallels itself for a bit. The balloon ladies were on the other side and they were calling out time every thirty seconds. They also tried to do a good job of keeping people crossing the line into our later lane. (That would cut about 7.5 miles off the course) I did see at least 3 people cut over. I don’t understand it, but to each his own I guess. Great crowds at the end, and I can honestly say I was tapped out at the end. There is usually a little bit in the tank for a final push in the end, but not today. 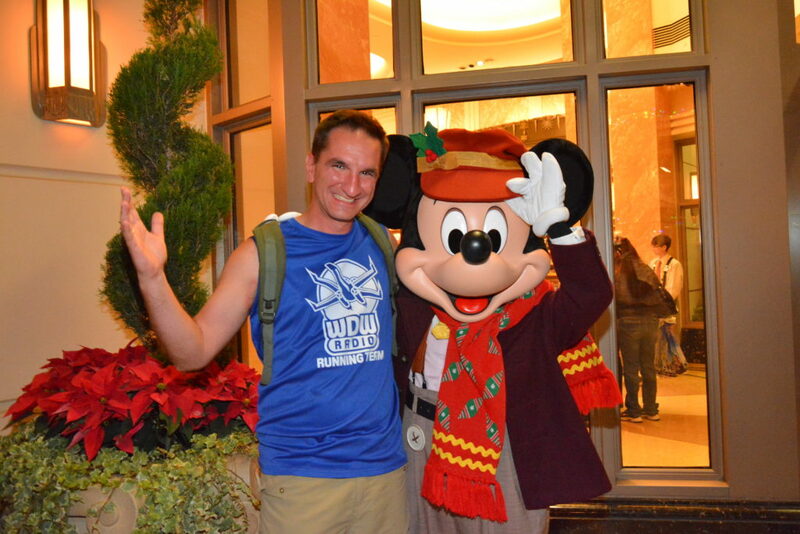 I did run into Disneyland Run Mickey at the end. (DW does black/red DL does blue/white) He was trying to wave me through and I wasn’t having any of it. I needed to get a least one new character today! 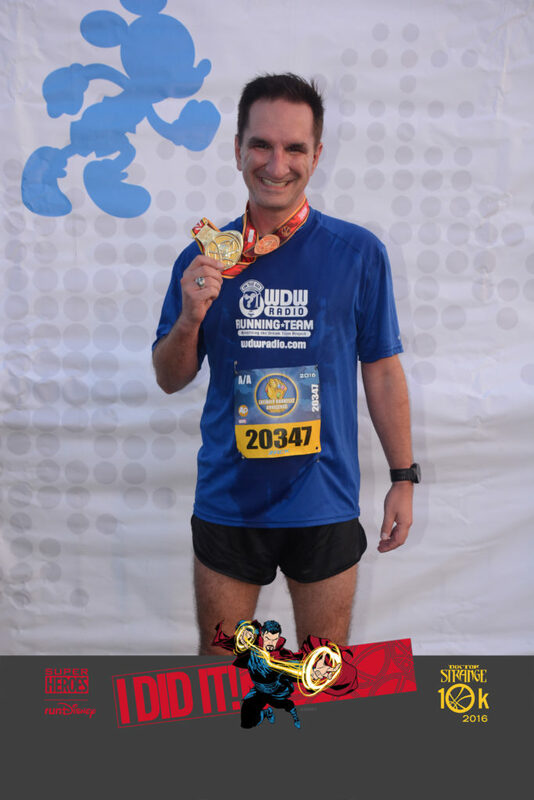 In the end I finished in the top 5% for the half! 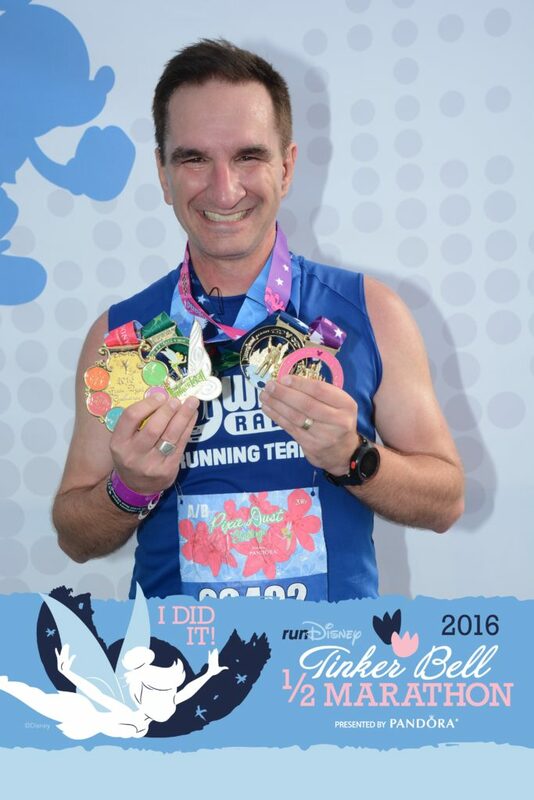 It wasn’t real close to my PR, but I was really pleased about it anyway. I would never had thought that the weekend would have turned out the way it did. It was also Mothers Day! 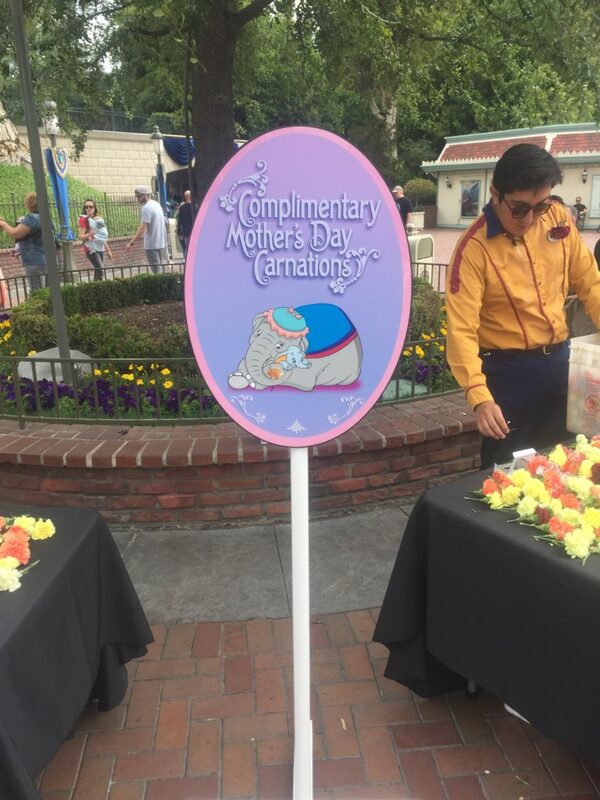 The park was giving out free flowers to moms which was a nice touch. Series completed! Next up is the Disneyland series in September.